You step through a shimmering portal onto the deck of an astral galleon. Prepare for a voyage unlike any other as you fend off githyanki pirates, thwart the sinister machinations of angels and devils, and challenge the might of the gods and their exarchs. From the cavernous layers of the Nine Hells to the dark dungeons of Tytherion, adventure awaits in every astral dominion and on the vast, uncharted sea that stretches between them. 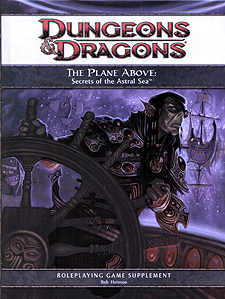 This Dungeons & Dragons game supplement explores the Astral Sea in detail, featuring key locations throughout the plane. It also presents new monsters, adventure hooks, encounters hazards, and everything Dungeon Masters need to make the Astral Sea a featured setting in their campaigns. Players Handbook, Dungeon Master's Guide, Monster Manual, D&D Miniatures and D&D Dungeon Tiles.